Muttiah Muralidharan a.k.a Murali, one of the greatest spin bowlers of all time has set a huge record of 800th Test wickets for the upcoming spinners in the cricketing world. He took his 800th test wicket by taking Pragyan Ojha’s wicket in the last day of the first test match between India and Sri Lanka in the Micromax Cup. His 8 wickets in the entire test match paved an easy path for Sri Lanka to clinch victory in their first test match in the Micromax Cup. 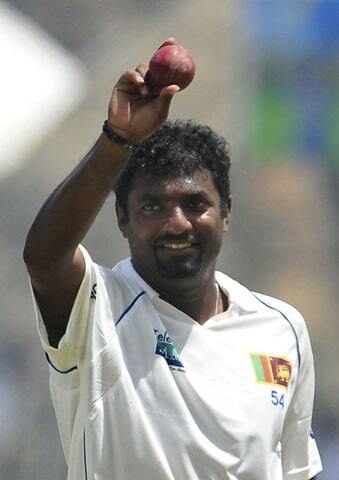 Murali has been praised a lot for achieving such a feat all around the World. Once he was called a chucker but with this world record I think he has silenced all his critics. In an Interview from a news channel, he had also mentioned that 800 is just a number and he doesn’t play for them but if he gets it then it would be great and he would like to see the team win the test, which has successfully happened. As an Indian fan, I’m not feeling bad that India lost the test match but feeling good to see a proper farewell match for Murali. He has got everything what he wanted from his last test match. Here is a video clip from YouTube of Murali’s 800th Test wicket. Whom do you think can beat Murali’ record ? Use the comments section to share your views about it. Heartiest Congratulations to our super star cricketer Murali. You have been a shining example to our younger generation. Your patience , integrity, fortitude and cheerfulness will be remebered in years to come. He was one of the bowlers whom the batsmen feared to face.